"I first fell in love with Rosali’s songs for this reason, the way her work takes you straight to that brave and big-hearted dream within songwriting. Every song stands strongly as it’s very own world, well-worn by the history of the underground but accessible as daylight." "Philadelphia singer-songwriter Rosali Middleman constructs verdant, contemplative rock songs whose soft exteriors conceal a steely core of cool observations about heartache and vulnerability." "Trouble Anyway (a co-release from Scissor Tail Records and the newly formed Spinster Sounds) doesn’t disappoint after its powerful opener. Bolstered by an all-star cast of Philadelphia-adjacent musicians (including Mary Lattimore the War On Drugs’ Charlie Hall and Purling Hiss’ Mike Polizze), the LP’s nine tracks soar and shimmer, whether on slow-burn ballads like “Dead and Gone” or churning rockers like “Rise To Fall.” Wherever Rosali goes, you’re going to want to follow." 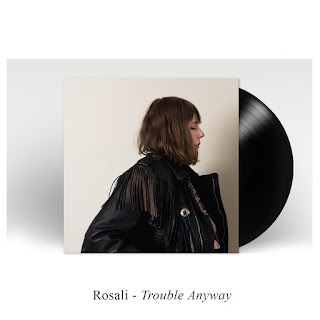 Philadelphia-based musician Rosali (Long Hots, Wandering Shade) wrote the songs for her second album, Trouble Anyway, seeking empowerment by sharing openly on love, power, aging, suffering, confusion, self-doubt, and anger. Resulting in a full-bodied record that is at once sweeping and intimate. A vulnerable and powerful exploration of emotional narratives, Trouble Anyway showcases her background in diverse musical styles from free improv, garage rock, country, pop, to folk-infused song-craft. 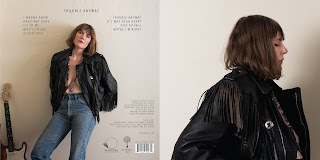 Following up her 2016 debut Out of Love (Siltbreeze), named one of the top 100 records of 2016 by Uncut Magazine, Trouble Anyway is a cohesive collection of lush, intimate rock songs, featuring her warm, natural vocals and powerful riffing and rhythm guitar, approaching the sublime when Rosali finds expression beyond lyricism, utilizing her voice as a human instrument. Backed by A-list musician friends, the collective instrumentation simultaneously accentuates Rosali’s singular sound and magnifies its orbit. Trouble Anyway is both otherworldly and straight-forward. Lyrical and wordless intensity, alongside intuitive musical arrangements, make for a powerful sophomore release. With collaborations from musician friends - Nathan Bowles (Steve Gunn, Black Twig Pickers), Dan Provenzano (Writhing Squares, Purling Hiss), Mary Lattimore, Paul Sukeena (Angel Olsen, Spacin’), Charlie Hall (The War on Drugs), Mike Polizze (Purling Hiss), Mike Sobel (Oldermost), and Gretchen Lohse (Carol Cleveland Sings)—Trouble Anyway was recorded and mixed by Uniform Recording’s Jeff Zeigler, who has also engineered records for The War on Drugs, Allison Crutchfield (also of Waxahatchee), and Kurt Vile, among others.